This workshop is organised by the Essex Safeguarding Children Board, Essex Safeguarding Adult Board, the Southend, Essex and Thurrock Domestic Abuse Board in conjunction with Essex Social Care Academy, Essex County Council. 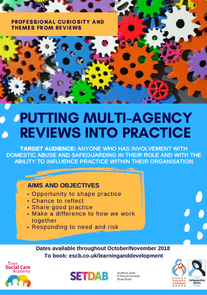 Target audience: Anyone who has involvement with domestic abuse and safeguarding in their role and with the ability to influence practice within their organisation. Dates available throughout October/November 2018 - find out more and book your place. 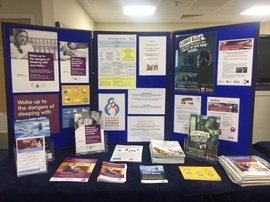 The first ESCB Assembly was held on Thursday 3rd May 2018 at Colchester United Football Club, with attendance from across the sector including Health, Education, Local Authority, Police and the Voluntary Sector. There were presentations from Alison Cutler, ESCB Board Manager and Phil Picton, ESCB Board Chair who spoke about the new structure of the Board, Clare Livens, Child Exploitation Project Manager who provided the group with an update on the work of Child Exploitation across the County and Karen Hammett, Practice and Development Manager who introduced the work of the Stay Safe Groups. The Stay Safe Chairs and Partnership Leads then highlighted some key areas of work being done within their quadrants. Group discussions looked at two main areas: resolving professional differences whilst encouraging challenge, and Early Help and Effective Support. The next assembly will be held in the autumn looking at the new Working Together document and future business plan of the board. The SET Summit brought together key partners from within the three authorities to discuss how they would operate under the new Working Together guidance. As a result of the discussions we can let you know that working arrangements will broadly remain as they are and the ESCB will remain in place. We will keep partners updated on progress. A multi-agency learning event was held in June, promoting emotional wellbeing and information sharing. Over the coming months changes will be implemented locally and learning cascaded through agencies. The learning will also form the basis of some of the work of the Stay Safe Groups. Papyrus, Anna Freud Centre and Hector’s House all presented on the day and you can find out more about their work following the links. There is also an Emotional Wellbeing and Mental Health page on the ESCB website with resources. The new Request for Support Portal and Website went live back in April. This website provides access to an online Request for Support Portal. The website also brings together in one place the Essex Directory of Services, guidance and tools to support practitioners in their work with children and families across Levels 1, 2, 3 and 4 of the Windscreen of Need. The online Request for Support Portal replaces the previous Children and Families Hub email route for submitting all non-urgent Requests for Support. This email route has now closed. There is more information on our Concerns about a child page. Remember the ESCB offer a variety of learning and development opportunities from Child in Need Training, Child Sexual Exploitation and Safeguarding Levels 1,2 and 3. Find out more. New courses and dates are often added so be sure to check the website regularly.